One discovers interesting facts and truths in certain ways. Some of us grow up surrounded by a world of Catholicism, including excellent, if we are fortunate, Catholic education and liturgy. I learned of this feast day a very long time ago. My parents put up the tree always on Christmas Eve when I was growing up, In fact they did this when we were sleeping and we did not see the tree until Christmas morning. The custom of waiting until Christmas or Christmas Eve to put up the tree was connected to the Feast of SS. Adam and Eve, as the Christmas Tree was a reminder of the Tree in Paradise, part of the reason for Christ's Coming. The Tree of the Knowledge of Good and Evil, of course, had red apples on it and the Medievals used these are part of the Miracle Plays on the Life of Christ done on the great feast says. That today was in the older liturgical calendars the Feast of Our First Parents, brought out of limbo in the Harrowing of Hell by Christ, as we say in the Creed, has been forgotten. Christ descended into hell and took those chosen by God, the righteous of the Old Testament, including Joseph, into heaven. "He descended into hell". In the old collect for this day, the phrase "O fault, O necessary sin of Adam" linked Christmas Eve with Holy Week. Today we think of the words in the Exsultet, which once were said on this day, this feast. Ambrose, Augustine, and Aquinas all write on this phrase. On the contrary, What frees the human race from perdition is necessary for the salvation of man. But themystery of Incarnation is such; according to John 3:16: "God so loved the world as to give His only-begottenSon, that whosoever believeth in Him may not perish, but may have life everlasting." Therefore it was necessaryfor man's salvation that God should become incarnate. I answer that, A thing is said to be necessary for a certain end in two ways. First, when the end cannot be without it; as food is necessary for the preservation of human life. Secondly, when the end is attained better and more conveniently, as a horse is necessary for a journey. In the first way it was not necessary that God should become incarnate for the restoration of human nature. For God with His omnipotent power could have restoredhuman nature in many other ways. But in the second way it was necessary that God should become incarnate for the restoration of human nature. Hence Augustine says (De Trin. xii, 10): "We shall also show that other ways were not wanting to God, to Whose power all things are equally subject; but that there was not a more fitting way of healing our misery." Now this may be viewed with respect to our "furtherance in good." First, with regard to faith, which is made morecertain by believing God Himself Who speaks; hence Augustine says (De Civ. Dei xi, 2): "In order that man might journey more trustfully toward the truth, the Truth itself, the Son of God, having assumed human nature, established and founded faith." Secondly, with regard to hope, which is thereby greatly strengthened; henceAugustine says (De Trin. xiii): "Nothing was so necessary for raising our hope as to show us how deeply Godloved us. And what could afford us a stronger proof of this than that the Son of God should become a partner with us of human nature?" Thirdly, with regard to charity, which is greatly enkindled by this; hence Augustinesays (De Catech. Rudib. iv): "What greater cause is there of the Lord's coming than to show God's love for us?" And he afterwards adds: "If we have been slow to love, at least let us hasten to love in return." Fourthly, with regard to well-doing, in which He set us an example; hence Augustine says in a sermon (xxii de Temp. ): "Manwho might be seen was not to be followed; but God was to be followed, Who could not be seen. And thereforeGod was made man, that He Who might be seen by man, and Whom man might follow, might be shown to man." Fifthly, with regard to the full participation of the Divinity, which is the true bliss of man and end of human life; and this is bestowed upon us by Christ's humanity; for Augustine says in a sermon (xiii de Temp. ): "God was made man, that man might be made God." So also was this useful for our "withdrawal from evil." First, because man is taught by it not to prefer the devil to himself, nor to honor him who is the author of sin; hence Augustine says (De Trin. xiii, 17): "Since human natureis so united to God as to become one person, let not these proud spirits dare to prefer themselves to man, because they have no bodies." Secondly, because we are thereby taught how great is man's dignity, lest we should sully it with sin; hence Augustine says (De Vera Relig. xvi): "God has proved to us how high a placehuman nature holds amongst creatures, inasmuch as He appeared to men as a true man." And Pope Leo says in asermon on the Nativity (xxi): "Learn, O Christian, thy worth; and being made a partner of the Divine nature, refuse to return by evil deeds to your former worthlessness." Thirdly, because, "in order to do away with man'spresumption, the grace of God is commended in Jesus Christ, though no merits of ours went before," as Augustine says (De Trin. xiii, 17). Fourthly, because "man's pride, which is the greatest stumbling-block to our clinging to God, can be convinced and cured by humility so great," as Augustine says in the same place. Fifthly, in order to free man from the thraldom of sin, which, as Augustine says (De Trin. xiii, 13), "ought to be done in such a way that the devil should be overcome by the justice of the man Jesus Christ," and this was done by Christ satisfying for us. Now a mere man could not have satisfied for the whole human race, and God was not bound to satisfy; hence it behooved Jesus Christ to be both God and man. Hence Pope Leo says in the same sermon: "Weakness is assumed by strength, lowliness by majesty, mortality by eternity, in order that one and the sameMediator of God and men might die in one and rise in the other--for this was our fitting remedy. Unless He was God, He would not have brought a remedy; and unless He was man, He would not have set an example." I wish the Church would reinstate this day as the Feast of SS. 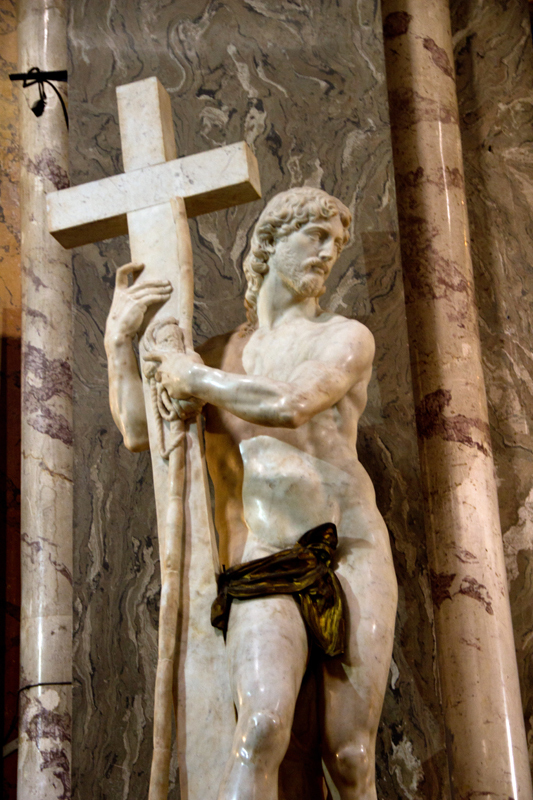 Adam and Eve and bring back the phrase which connects our thoughts with the Easter Vigil. Such a bridge of faith would help us make this a holy day, and not a day of forgetfulness and fun. Many of us older ones also remember when Christmas Eve was a day of fast and abstinence, as it should be again. To play and party on this day seems common now, as many families have Christmas today, instead of tomorrow, or on both days. Pause and prepare yourselves by thinking of Adam and Eve, on the felix culpa, on your own sins, as the reason for Christ's Incarnation and coming into this world. 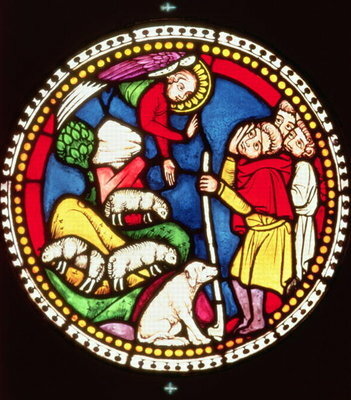 I always thought that one of the reasons why the angels came to the shepherds was that they represent the Old Man of sin, Adam, who is the Garden of Eden was a gardener, and who, after his very bad choice, had to work hard for his food, shelter, and clothing. Those lowly Bedouins in the fields around Bethlehem remind us that we are unwashed, unclean, simple, even outcasts, waiting for redemption. I sincerely hope you are waiting for Christmas, Dear Readers, not rushing about and forgetting the great mystery of our redemption in baptism, the new life given to Adam and Even this night and to us in baptism. 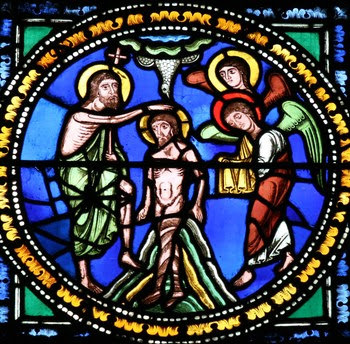 I was reminded by a certain seminarian that one of the reasons for the long fast in Advent in earlier days was that people were baptized on the Feast of the Baptism of the Lord. The waiting in penance was part of the preparation for baptism. What Adam and Eve gained in the Harrowing of Hell, we gain in the pouring of water over our heads-freedom from Original Sin, and the gift of eternal life with God. Their wait was a very long time. We have become so impatient, that we cannot even wait for Midnight in order to start celebrating Christmas. Perhaps meditating on the Feast of Adam and Eve will help us see this day in a different light.